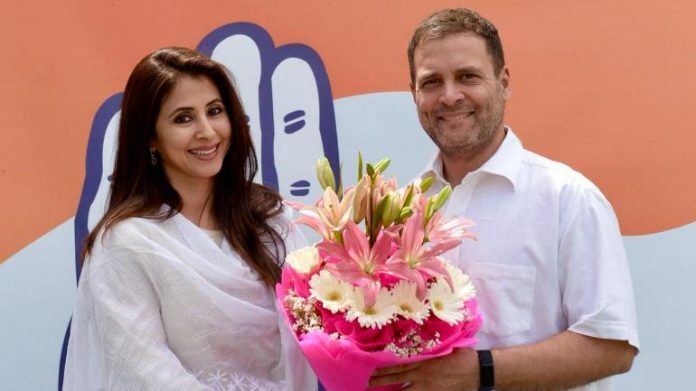 New Delhi: Two weeks ahead of the commencement of Lok Sabha polls, Bollywood actress Urmila Matondkar joined the Congress party on Wednesday after meeting party president Rahul Gandhi here. “Congress President @RahulGandhi welcomes Smt. Urmila Matondkar to the Congress Party” read a tweet posted by the party from its official Twitter handle. Matondkar was inducted into the party by Congress spokesperson Randeep Surjewala and newly-appointed Mumbai Congress chief Milind Deora. “Freedom of speech is necessary in the country. Today this freedom is in danger. I’m not here to show glamour. I am here to stay; I am here because I have faith in Congress’ ideology” she added. Matondkar started her career at a very young age. She first starred in a Marathi film, ‘Zaakol’ in 1980, and a year later, made her Bollywood debut alongside Shashi Kapoor in the film ‘Kalyug’. Some of her noted work includes ‘Satya’, ‘Rangeela’ and ‘Pinjar’.